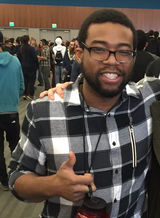 MJG is an SSB4 Villager and Toon Link co-main from Olathe, Kansas, and is considered one of the best Villager players in the United States. MJG is currently ranked 12th on the Midwest Smash 4 Power Rankings, and 1st on the Kansas Power Rankings. He has taken sets off of Nairo, Tweek, MVD, Ned, DKwill, Angel Cortes, and JJROCKETS. In SSBB, MJG was also a Toon Link player, and was considered one of the best Toon Link players in the world. MJG was formerly ranked 36th on the 2014 SSBBRank. Smashfield Weeklies #9 October 1st, 2015 4th ? ? MJG is known for his tendency to place better in Doubles than in Singles. This page was last edited on February 13, 2019, at 16:57.